Yellow-streaked Lory pairs often engage in acrobatic flying with much calling to each other. C.s. scintillata: Both adults mostly green, the feathers pale green on shaft on head to abdomen and bright yellow on breast and mantle; red forehead, lores, thighs and underwing coverts, in female less evident on forehead; red on sides of breast; underwing banded with yellow. Bill black. Eye ring bare and grey. Skin at base of bill grey/black. Eye orange/red. C.s. chloroptera: As in scintillata, but narrower streaking in plumage; green underwing coverts with or without red markings. C.s. rubrifrons: As in scintillata but broader, orange/yellow streaking in plumage. C.s. scintillata: As in adults but with minimal amount of red on forehead; varying yellow marks at base of bill. Eye brown. C.s. chloroptera: As in adults. C.s. rubrifrons: As in adults. Vocal while in flight and when perched. A electronic-sounding screech and many syllabled musical notes of varying tone and length. Aviary with well-drained floor (sloping concrete with drains) or suspended cage over concrete. Commercial type or a mixture of baby cereal (lactose-free), honey, and malt extract or molasses, mixed with bottle water, made fresh once or twice daily; also fresh fruit like apple, pear, orange, banana, cactus fruits and one or more of the following: carrot, corn on the cob, green leaves, rearing food made from hard boiled egg and wholegrain bread, ground to crumbly consistency. Hanging nectar bottles or cups around aviary, providing unsprayed browse with edible flowers, various chew (bird-safe woods) and plastic toys (non-toxic); provide bowls of water for bathing. 10" x 10" x 20" (25.4cm x 25.4cm x 50.8cm) high. C.s. scintillata: S New Guinea, east to Fly River, W Papua New Guinea. C.s. chloroptera: SE and SC New Guinea, west to Fly and Noord Rivers, E Irian Jaya. C.s. rubrifrons: Aru Islands, Indonesia. Lowland savannahs and nearby forests, usually secondary growth. Also coconut plantations and mangroves. Up to 800m (2624 ft). Nectar from flowering trees, and fruit. 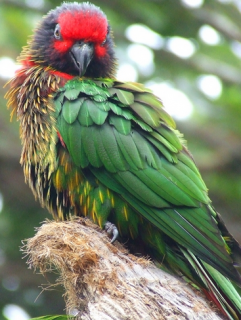 Gregarious, in pairs or groups of up to several dozen individuals; also spend time with Rainbow Lorikeets and Red-flanked Lorikeets in flowering trees. Aerial displaying frequent. 2 rounded eggs, about 30.0 x 25.0mm (1.2 x 1 in).